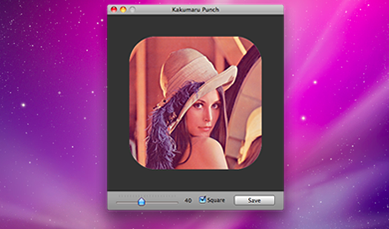 LNSOFT popular work "Kakumaru Punch and Zenmaru Punch" in the Mac version comes out. 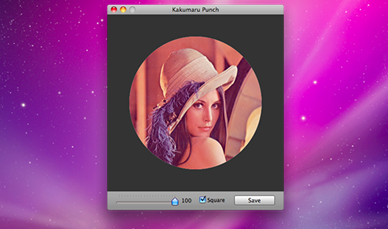 Rounded Punch is a simple image editing software easy to operate even for beginners. Rounded corners and photos, you can cut a square or a photo. Try the iPhone photo app icons like how about you? With rounded corners that may be lurking in the human sense of peace and comfort. This original windows version is here. 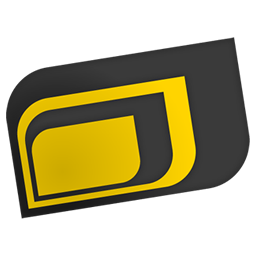 - Rounded Punch digital camera photos! - You can edit your photos easy even for beginners. - Installation: Please copy directly to any folder. - Uninstall: Please delete the application as a copy. - Launching an application: Click on the application, or drop the file. (1) Pictures (image files), drag and drop application and please. (2) Please adjust gauge the strength of the rounded corners. Square Cut out a square or a check automatically. - The destination is the same location as the original file "the original file name - punch with rounded corners"to save the form. - JPEG / JPG / TIFF / TIF / PNG / GIF formats. - JPEG / JPG, the background is white with rounded corners.